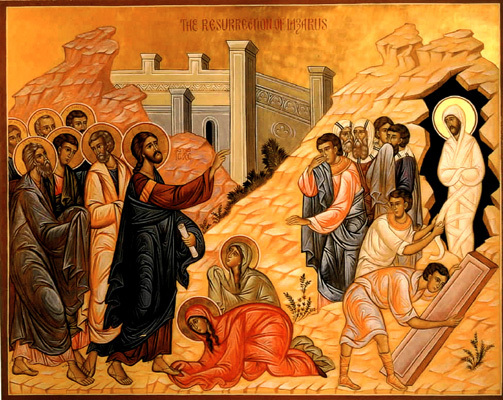 In today’s Gospel, Jesus turns mourning into joy when He raises Lazarus from the dead. Today’s Gospel gives us a story about Jesus raising the dead to life, something He did on at least two other occasions (see Lk 7:11:17, Mk 5:21-23). This episode, however, is profoundly different from those in three ways: (1) Lazarus was a dear friend of Jesus, not a complete stranger (2) Jesus purposely allowed His sick friend to die (3) the dead man was in a tomb long enough to decay. With these details, we find ourselves in a resurrection story that will penetrate deeply into the mystery of the miracle. St. John tells us that the sisters of Lazarus sent word to Jesus that he was ill. They appealed to Him in their darkest hour because of His great love for them (Jn 11:5). Instead of speeding to their home to help, Jesus announced that “this illness is not to end in death, but it is for the glory of God” (Jn 11:4), and He stays two days longer where He was. Does it surprise us that Jesus was willing to allow Lazarus to undergo death, catapulting his sisters into agonized grief? We can only imagine what those two days were like for that family. Lazarus’ pain and physical decline continued to advance, while the sisters were struck a double blow. Not only did they watch their brother die, but their Friend failed to help when they cried to Him out of the depths of their suffering. After waiting two days, on the third day (hint, hint) Jesus went to Bethany. Both Martha and Mary told Him what was in their hearts: “If You had been here, [our] brother would not have died” (Jn 11: 21,32). It is clear that the pain of Jesus’ absence and seeming indifference to them equaled the pain of losing Lazarus. They knew He could have prevented the death; they also knew He chose not to. Jesus answered their deep disappointment with a promise: “Your brother will rise” (Jn 11:23). Martha thinks Jesus is talking about something way off in the future, “on the last day” (Jn 11:24). Jesus’ reply must have startled her. The resurrection and life she hopes for her brother is not an event on a distant calendar; it is a Person. “I am the resurrection and the life” (Jn 11:25), He tells her. Death cannot affect one who believes in Him. Then, He shows her (and us) what He means. The drama heightens as Jesus draws near the tomb. “Take away the stone” (Jn 11:39), He says. Now we begin to understand why this particular raising of the dead is full of glory. The “third” day, the weeping women, the rolled away stone, the burial cloths—this resurrection is a foreshadowing of Jesus’ own resurrection when, once for all, He conquered death, the sin that causes it, and the Enemy who uses it to haunt and terrorize us. “Lazarus, come out!” (Jn 11:43) Simply by the Word Jesus spoke, Lazarus appears alive. What would the disciples have learned from this event? First, Jesus was not afraid to disappoint and cause temporary pain for Martha and Mary, because He knew He could work a greater good through Lazarus’ death than through healing the sickness that led to it. If we are not going to give up as disciples of Jesus, we must understand this truth. When we cry out from the depths of our suffering and hear only silence, we are not to give up. A greater glory is at work; this we must trust with all our hearts. Second, Jesus is not unmoved by our suffering, even when He seems to be. His weeping over the family’s grief proves that Love is always present, no matter how things look. Third, resurrection life begins for believers in the here and now, not off in the future. Nothing illustrates this more graphically than Lazarus, bundled up in burial cloths, walking out of his own tomb. As Pope Emeritus Benedict XVI wrote in Jesus of Nazareth: Holy Week: “Eternal life is not—as the modern reader might immediately assume—life after death, in contrast to this present life, which is transient and not eternal. ‘Eternal life’ is life itself, real life, which can also be lived in the present age and is no longer challenged by physical death. This is the point: to seize ‘life’ here and now, real life that can no longer by destroyed by anything or anyone.” This is the eternal life Jesus gives to Lazarus and to all of us who believe in Him: “Untie him, and let him go” (Jn 11:44). We are finally free from death. Possible response: Jesus, sometimes I’m disappointed when You don’t act as quickly as I want You to. Teach me to trust in Your wisdom rather than mine. In the Gospel, we noted that Martha believed in a resurrection of the dead “on the last day.” For the Jews, this belief was slow to develop. For most of Israel’s history, the afterlife was only dimly imagined. It was not until the Exile, when Judah was punished for its sin by being sent into “death” away from the Promised Land, away from the Temple and the glorious worship of the covenant, that the prophets began to speak of a rising from death. In this passage from Ezekiel, a prophet in the time of the Exile, God promises to return His people to their land, putting His spirit in them so they can live. “I have promised, and I will do it” (Ez. 37:14). He kept His promise. The people, contrite over their covenant unfaithfulness, were able to return to their homeland like men coming back from the dead. Increasingly, Jews began to have a meaningful concept of resurrection, life after death. In the Gospel story, Ezekiel’s prophecy comes true literally, as Lazarus’ tomb was opened, and he regained his life. Jesus fulfills all God’s promises. Possible response: Father, You have promised us eternal life through Your Son, a life that starts right now. Help me always to believe in Your promises. The psalmist’s cry must surely have been on the lips of Lazarus’ sisters as they waited helplessly for Jesus to arrive and watched their brother die: “Out of the depths I cry to you, O LORD; LORD, hear my voice!” (Ps. 130:1). Here is the plaintive cry of all of us when we are in great darkness and suffering. We can either fall into despair, or we can pray the psalmist’s prayer: “I trust in the LORD; my soul trusts in His word” (Ps. 130:5). See that the psalmist waits for the LORD “more than sentinels wait for the dawn” (Ps. 130:6). The watchmen who alerted Israel to the first rising of the sun weren’t waiting to see if the sun would come up, but when. Thus it is for us as well. That the LORD will come is not in doubt, because “with the LORD there is mercy and fullness of redemption.” Waiting for the Lord bore fruit for Martha and Mary, as it will for us, too. Possible response: Jesus, give me ears to hear when You call me to “come out” of my sin, self-absorption, or indifference to You. Help me flee the decay and stench of life without You. This entry was posted in A, Lent, Season, Sunday Lectionary Readings, Year. Bookmark the permalink.